A 65-year-old woman presented with a 20-year history of seropositive rheumatoid polyarthritis. Her disease had destroyed most of her major joints of the body, including both knees, hips, elbows, wrists, finger joints, spine and joints of the feet. She had undergone a successful bilateral total knee replacement surgery 7 years ago. For the past 2 years, she had been having difficulty in standing and walking with ‘noises’ coming from both hip joints. 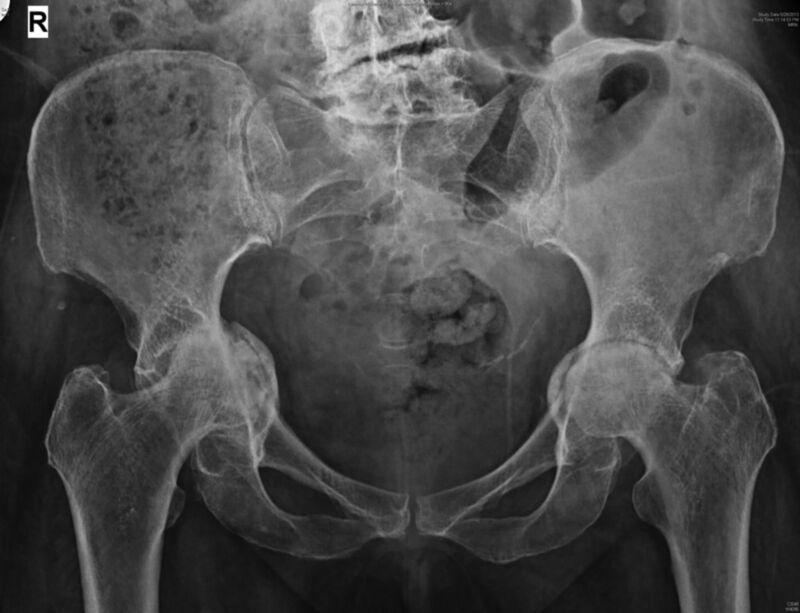 An X-ray of the pelvis (anteroposterior view) showed severe bilateral hip arthritis (figure 1) with migration of the femoral head (R>L) into the pelvis (protrusio acetabuli). She had undergone a bilateral simultaneous total hip replacement surgery (figure 2) 6 months ago. 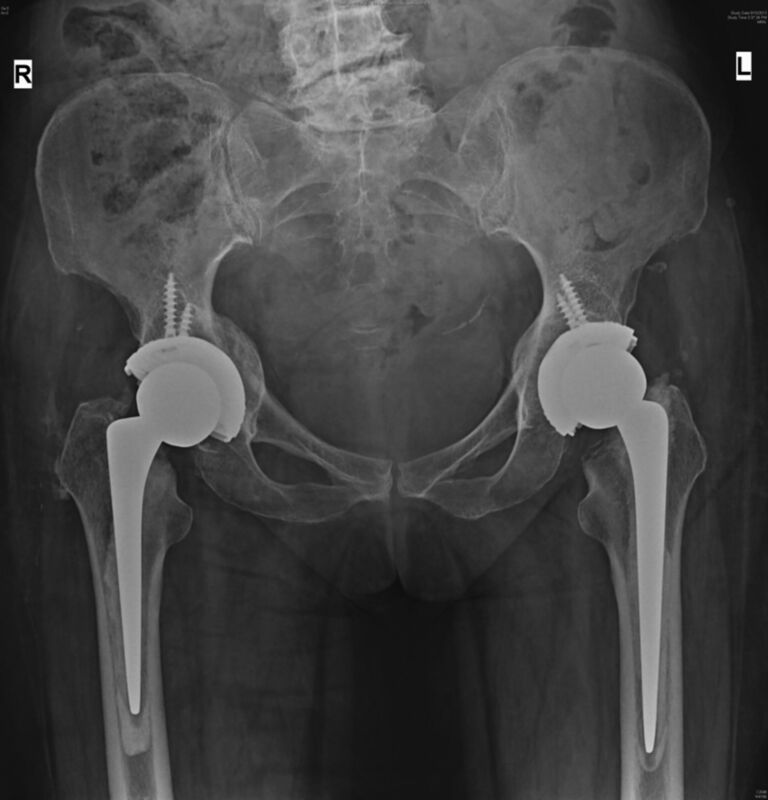 The surgery was performed as a single-stage procedure using hybrid hip prosthesis on both sides, where a cemented femoral stem (Exeter stem) and an uncemented cup were used with impaction bone grafting of the acetabulum. She is now pain free and is able to walk and stand comfortably. Preoperative X-ray of the pelvis showing bilateral hip arthritis and severe protrusio acetabuli. Postoperative X-ray showing bilateral total hip replacements, in situ. Rheumatoid arthritis can present with bilateral protrusio acetabuli of the hip. Severe bilateral hip arthritis can be treated effectively by a simultaneous total hip replacement surgery. Protrusio acetabuli is a condition where there is medial migration of the femoral head into the pelvis.
. The aetiology of protrusio acetabuli. Literature review from 1824 to 2006. Acta Orthop Belg 2006;72:524–9.
. Protrusio acetabuli: diagnosis and treatment. J Am Acad Orthop Surg 2001;9:79–88.
. Total hip arthroplasty in protrusio acetabuli of rheumatoid arthritis. J Bone Joint Surg Am 1980;62:1059–65.